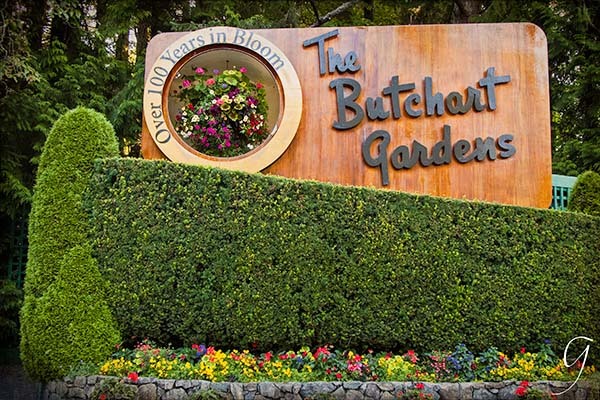 Don't drop in to Butchart Gardens in Victoria... unless you want to be astonished and spellbound by the beauty and diversity of this ambrosial display garden. A welcoming sign at the entrance to the garden greets visitors from around the world. As if it weren't enough, the gardens aren't the only draw. The gift shop is inside the front entrance, off Waterwheel Square. Never a worry about snacks and meals... there are several restaurants to fuel up at while you putter about the gardens. An absolute must... make a reservation for afternoon tea before you're off and running. You can do that right off of the Square. Keep your camera out while you're in the Dining Room and the Blue Poppy Restaurant. I did a juggling act with my photography, tea and meals. The staff were quite happy to accommodate multitasking picture takers. Since we're on a tour of the gardens, the official website has a map you might want to check out to orient yourself. Choose your language and download a PDF. The Blue Poppy Restaurant banners are good subjects for photos. Lots of vertical lines with the windows and receding lines leading off into the distance. Need a review of photographic composition? Keep going back to the basics to make better images. 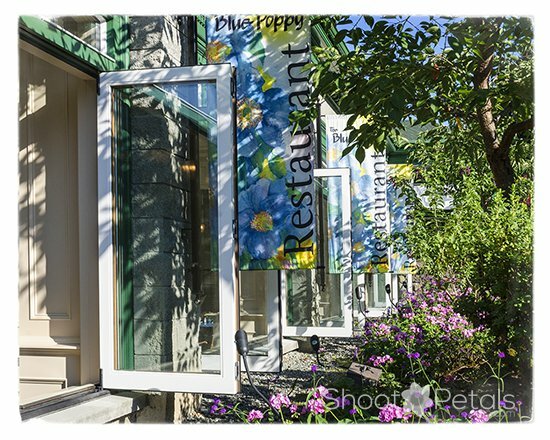 The Blue Poppy Restaurant at Butchart Gardens feels as though you're dining outdoors when all the large windows are opened up. Ever tried taking panorama photos? Great with a DSLR on a tripod but even better with your cell phone camera! The iPhone has a native app to capture panoramas but, OMGosh there are so many apps you can download to get amazing panos. Get a small taste of what you can do with your cell phone camera. Butchart Gardens panoramic view of the lawn, perennial border, walkway, private garden and award winning dining room - part of the original home. Afternoon delight... 'de-light-full'! While the sun is bent down to kiss the horizon, its aura turns gold. This is when the world becomes a magical place for photographers. For the warmest, sweetest light, get yourself up and out in the early morning or evening. Take your camera along with you since this is the light that they also adore. The Italian Garden, at the Gelateria Benvenuto, has glorious golden light falling on it in the evening. This is the light that photographers pray for! Rose are always a big draw in any garden. Butchart Gardens formal rose garden is always spectacular. This view is well photographed by millions of spellbound tourists but it's just one scene in the phenomenal rose garden. While you're in the formal rose garden, get close-up photos of the elegant roses as well as landscape shots. And turn your camera for vertical pictures as well as the usual horizontal shots. 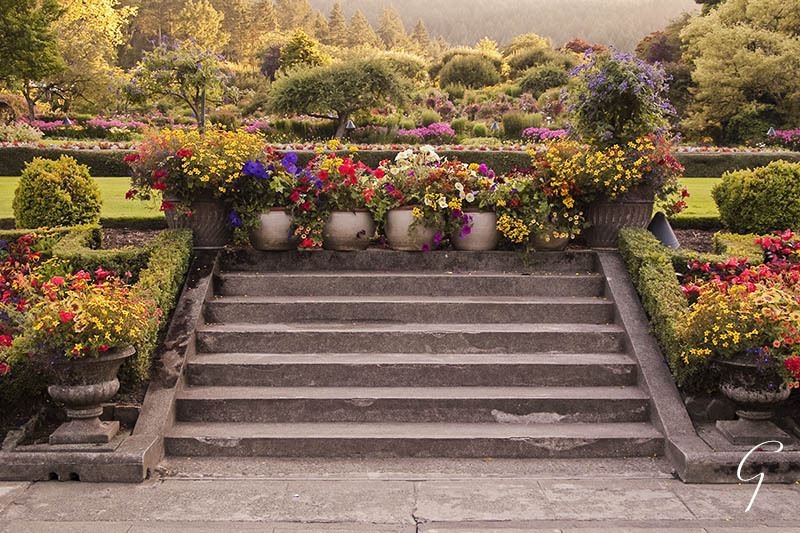 The formal rose garden at Butchart Gardens has blooms to entertain from spring through fall. Never leave your camera at home! This is by no means a complete round of the magnificent Butchart Gardens. But keep going to see how I edited some of the images. 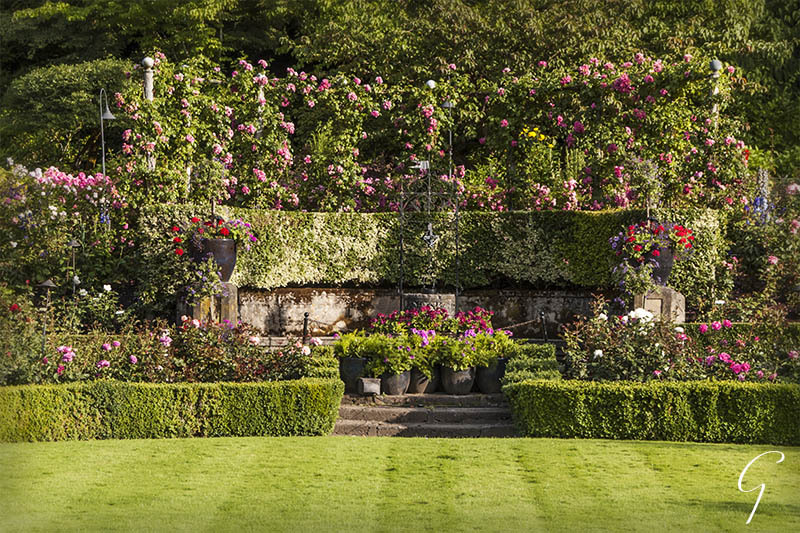 It might give you a few ideas for your own photos when you visit this amazing garden. Once upon a time, a photographer took a picture that had the most horrid sun flare streaming across her otherwise incredible landscape image. "My beautiful image is ruined", she cried! Today, if she hadn't trashed that image, it might have sold a thousand times over and been a favourite in her online portfolio. Times they are a' changin'! Sun spots and flares are acceptable and even sought after today. If you peruse the best sellers on microstock sites like iStock or Shutterstock, you'll see that sun flare has ratcheted up its game. For now, take advantage and play with it in your photo editing. Annebelle stands near the Rose Carousel at Butchart Gardens. Beautiful light is falling down along her back in this image. 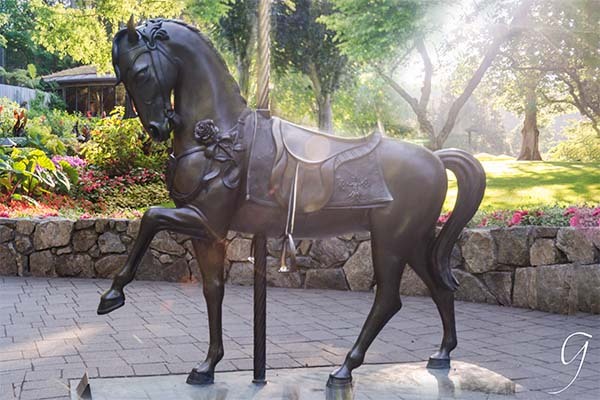 Meet Annebelle, the bronze mare close by the Rose Carousel at Butchart Gardens. The sun was streaming in from the upper right and it softens the metal on her back and rump. Isn't she a proud little horse? I love this photo. The sun beams are natural with no major photo editing. Annebelle's lovely portrait gave me an idea for a photo I shot just a bit later from the lookout over the Sunken Garden. HDR, view through the poplar tree to the quarry garden. I added additional sun flare to the top right. This is an image of the sunken garden from the upper walk. There's an impressive view of the garden below. I bought some sun flare files to add to my Photoshop bag of tricks. Though, this photo already had a sun flare, I added more to it. I got my set of sunflare files, Into the Light from Craft & Vision. I love all their products and I don't get paid to say so! Just a touch more sun, not a lot... it evened out the light and gave the look and feel I wanted. 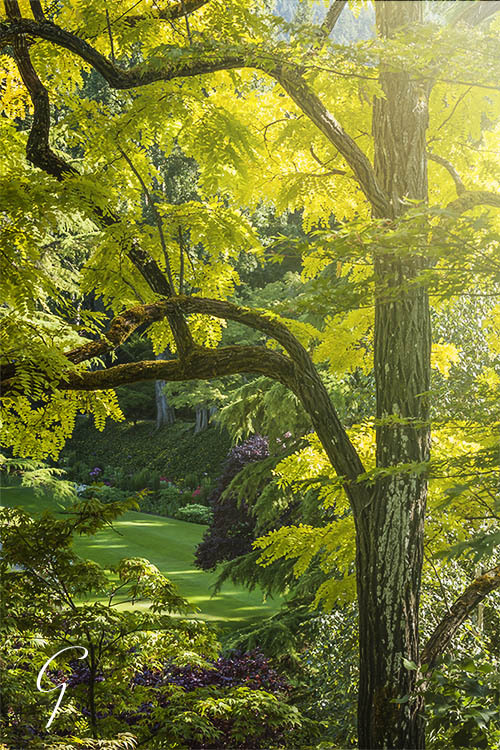 This was late afternoon or early evening at Butchart Gardens and the sunken garden was in dark shadow... impossible to shoot with the contast. I took 5 or 6 pictures at incremental exposures and merged them in Photoshop HDR Pro. That lightened up the shadows and gave an excellent exposure. Four of the images were enough. But, what is HDR ? Your camera can't capture the range of light to dark that your eyes can. Which is why, so often, WYS isn't WYG**! When you take a picture on a bright and sunny day, the image doesn't show a lovely blue sky... it's all yucky white, blank space. The "things" like trees and flowers or people might look properly exposed. Or, the sky is perfect and the rest is just a dense black shadow. You have to choose if you're going to expose for the lights or the darks but you can't have both! ... Except, you can! What you need to do is put your camera on a tripod, figure out your "average" exposure and take 1 or 2 stops darker than what you calculated and then 1 or 2 stops lighter. It's absolutely imperative that your camera doesn't move. Run straight home and load those 3 to 5 images onto your hard drive, fire up Photoshop (or another program that will merge your images into an HDR. Wait a minute or two, make your adjustments when Photoshop offers. If you like the image, hit save. Voila.... you've captured a large range of light that wouldn't be possible without HDR software. The Sunken Garden at Butchart Gardens is a challenging place to photograph with the diversity of light and dark areas. A good place to experiment with HDR. Get both horizontal and vertical shots. In this landscape, the vertical was more challenging because of the tall trees alight in the sun. 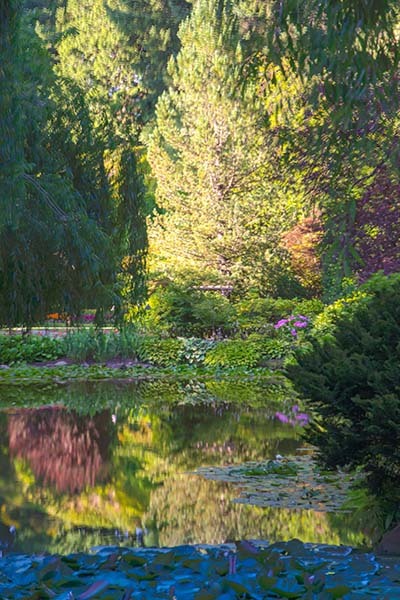 In this vertical shot of the pond in the sunken garden, shaded trees frame the very bright trees behind. Framing a subject is a good idea to hide very bright skies that will look white in your image. In my case, the dark trees are a nice contrast to the very bright trees behind them. Need to brush up your composition skills? Vertical HDR image of the pond in the sunken garden. A blending of 3 images taken at incremental exposures. Apricot gelato... that's what the colour of this begonia reminds me of. Yummy! It's afternoon tea time in the Dining Room. The light is perfect and I'm doing a balancing act with my late afternoon tea and my photography. It's a time squeeze I'm all too happy to handle! A few months after I edited it, I decided to try a texture layer. It's a soft, gentle image so not a good candidate for a grungy, dark layer. Your thoughts? 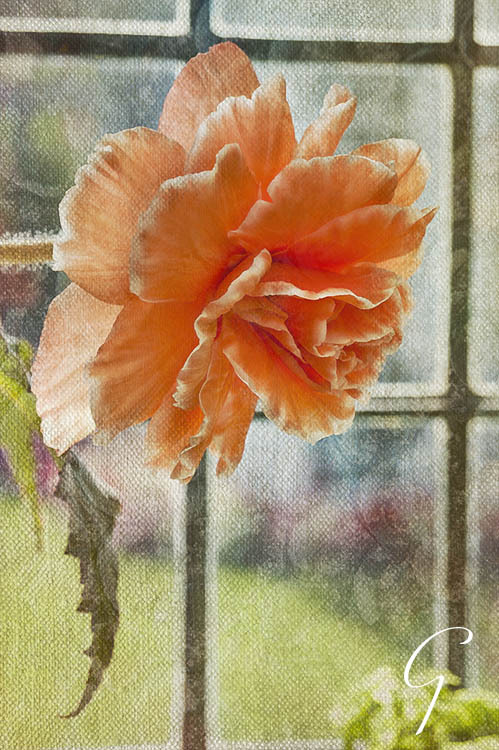 The same peach begonia image with several texture layers. I used a pebbly, circular patterned texture... a photo of temple roof in Thailand. I added 2 more textures, one a canvas and the other an oil painting layer. I've been adopting the "painterly" look in my photos and love it! You don't have to be real, you know. Be anything you want! 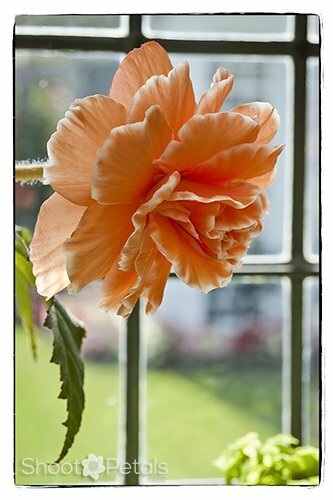 This soft peach coloured begonia is in the window of the Dining Room. I applied a texture layer, reduced the opacity for a very soft look. 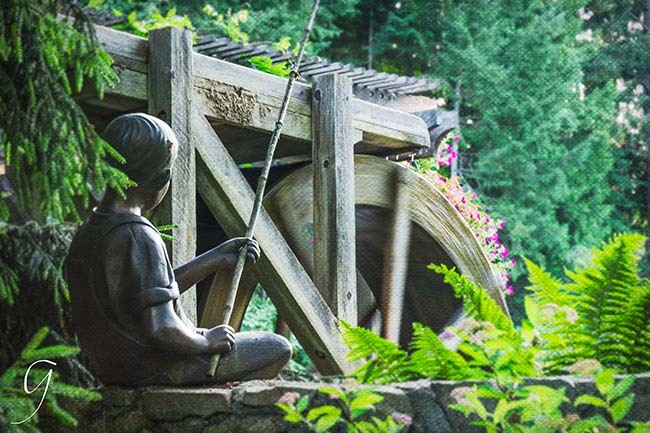 Occasionally, I sit in Waterwheel Square, just as you enter Butchart Gardens, to plan out my day. Usually I've already committed to my goals and besides, I'm raring to go when I first arrive. But, after many hours walking, photographing and pleasantly weary, I'll sit and have a tea in the Square before leaving. Maybe my way of hanging back, disappointed that it's over... at least for now. It's a nice area to find a bench, relax for a few moments... double check my photos with my list and double check that all the images I planned on are there. Nothing worse than getting back to the hotel and realizing I missed a crucial photo. Little boy with his fishing pole in Waterwheel Square. 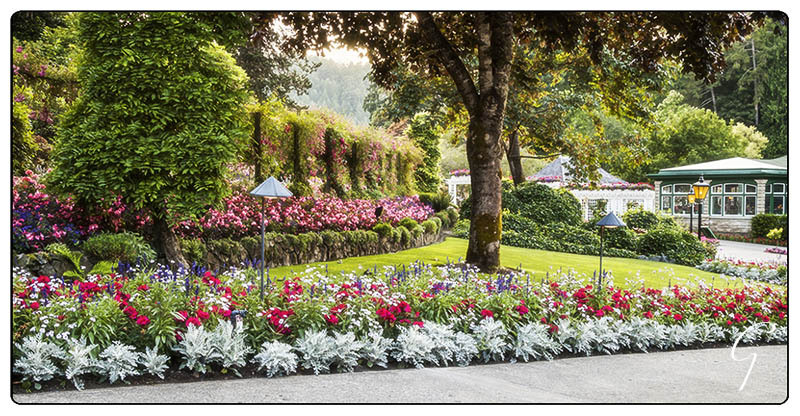 Before you exit from Butchart Gardens, there's plenty of area here to sit and review all your photos from the day. Butchart Gardens is an absolute must to visit. Put aside an entire day and stay into the night for the fireworks display if you can. Don't try to get through this garden in an hour or two! Get online and have an idea of what pictures you'd like to get and carry your list with you. Use the link at the top to download a map so you can plan your day. Then thoroughly enjoy the garden and your afternoon tea.